America is becoming hooked on gambling. From the millions of dens and dorm rooms lit by online poker games to the neighborhoods transformed by new casinos and slot machine parlors, legalized gambling has become an integral part of our lives. With a singular blend of investigative journalism and poignant narratives of gambling addiction, award-winning journalist Sam Skolnik provides an in-depth exploration of the consequences of this national phenomenon. 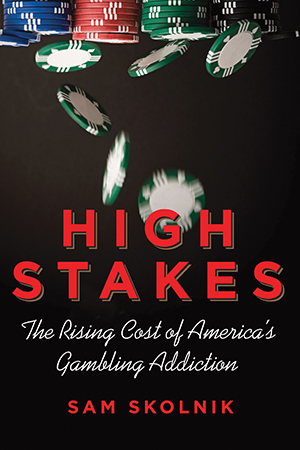 The result is High Stakes, an unflinching look at the explosive growth of legalized gambling in our country, the concurrent rise of addicted gamblers, and what it all means. Thirty-five years ago, casinos were legal in just one state, Nevada. Today, legalized gambling has morphed into a $92 billion industry established in all but two states. As elected officials are urging voters to expand gambling’s reach, the industry’s supporters and their equally impassioned detractors are squaring off in prolonged state-by-state battles. Millions of Americans are being asked to decide: Are the benefits worth the costs? Industry officials and their political allies assert that gambling is an effective way to raise revenue and create jobs. But these rewards come at a steep price. Fast-rising numbers of addicted gamblers are causing higher indebtedness and bankruptcy rates, as well as increased divorces, suicides, and gambling-related crime. Skolnik shows how the gambling industry is targeting Asian Americans-and why this population, more than any other ethnic group, is likely to develop gambling problems. He also illustrates how gambling has helped turn Las Vegas into America’s most dysfunctional community, and how the upsurge of poker and Internet gambling has created a new generation of gambling junkies. In High Stakes, we meet politicians eager to promote legalized gambling as an economic cure-all, scientists wrestling with the meaning of gambling addiction, and ensnared players so caught up in the chase that they’ve lost their livelihoods and their minds. Throughout it all, Skolnik-an avid poker player-never loses sight of the human side of these struggles. Walk into a Las Vegas casino, or any of the almost countless bars, groceries, and retailers throughout the region with video poker machines, and there is a good chance you will see a rack of glossy pamphlets showing an orange sun setting over a black ocean. The words When the Fun Stops are stenciled above the image. Every eighteen to twenty-four months, the Nevada Council on Problem Gambling prints a 200,000-copy run of its brochure. For more than a decade, the council has sold the brochures in order to help satisfy Nevada Gaming Commission regulations that require every licensed gambling outlet in the state to provide information on the nature and symptoms of problem gambling in “conspicuous places,” including ATMs and casino cages. Some casino companies produce their own materials. But several others, including MGM Mirage and Station Casinos, have used the council’s brochures for years (MGM Mirage changed its name to MGM Resorts International in June 2010). The council distributes the remainder to local seniors facilities, community centers, and schools as part of its efforts to raise awareness about the dangers of gambling. Inside, the pamphlet provides a description of problem gambling, a listing of warning signs, and a toll-free number to call for help. Howie--who asked that he not be identified by his full last name given his thirty-seven years in Gamblers Anonymous--is a small, trim man with a gray and white goatee that points off of an angular face. At seventy-one, he is clear-spoken and has a sharp recollection of recent and decades-old events in his life. We spoke over a late breakfast at a Las Vegas diner. The story of Howie’s descent into addiction is not exceptional. What is extraordinary is the story of how in the early years, beginning with his first GA meeting, he nearly single-handedly built the infrastructure to aid problem gamblers in Las Vegas, and then, part of the rest of the United States. When I mentioned to a friend of mine from GA in Seattle that I was moving to Las Vegas, he urged me to look Howie up. “He’s a legend,” he said. Howie first reached his gambling limit in 1971, six years after moving his family from Los Angeles to Las Vegas to become a professional gambler. Quickly realizing that he would not be successful in his new choice of profession, he found a career in the casino business, like many Vegas gamblers. Howie spun so out of control that he contemplated suicide because of his gambling, so he searched for a Gamblers Anonymous meeting in Las Vegas. Unable to find any GA presence in the nation’s gambling capital, he took his family on vacation to San Diego and attended his first GA meeting there. It was a revelation to be able to tell his story to others who had undergone similar traumas and to hear their stories. The other gamblers told him about the one small weekly meeting then held in Las Vegas and how to find it. He showed up the following Monday evening at a Methodist church just blocks away from the downtown casinos. Five people including Howie sat around a card table. But it was a different experience than the San Diego meeting. Only two of the five attendees spoke--by engaging in an hour-long argument-- and a couple of the people actually were there to get gambling tips, not to talk about the destructiveness of their habit and their need to quit. It was like an alcoholic showing up to an AA meeting because he needed directions to the nearest bar. Howie concluded that he needed to get involved and set up other weekly groups. In part, this was self-preservation: he had to attend, and therefore create, meetings closer to the beginning of the weekend, or there was a greater chance he’d slip and gamble. He quickly became the founding father of the GA movement in Las Vegas. For the first decade after he started with GA, he founded all of the meetings in Vegas. And he took on all the necessary roles to help the meetings grow: founder, meeting chair, secretary, public relations liaison. “Every position there is in GA, I did them all,” he said. By 1981, he estimated that there were twenty-eight different weekly meetings in the region. He also helped start meetings in several western and southern states, and internationally, in England, Iceland, and Australia. In time, Howie founded the Nevada Council on Problem Gambling, an offshoot of the National Council on Problem Gambling that educates state residents and procures funding for treatment programs and a toll-free help line. For more than two decades he also worked as a counselor with the Problem Gambling Center in Las Vegas, the leading gambling treatment facility in the state. He was, as he says, a man of many hats. That changed on March 18, 2009. After thirty-seven years of abstinence, Howie gambled. Soon after, he left GA and was fired from the Problem Gambling Center after being spotted placing a sports bet at a locals casino in north Las Vegas. Robert Hunter, the founder and clinical director of the center, said he received e-mails from recovering gamblers around the world distressed by Howie’s return to a gambling life. He said he urged them to dwell on the notion that Howie might someday come back to the movement--and that regardless, the good he did could never be undone. There’s a reason why Howie was easily able to spread his gambling abstinence gospel during his early days in Las Vegas, and why after decades in recovery, he found himself in a position to fall off the wagon quickly. It’s the same reason why many Las Vegans have suffered devastating downward spirals after finding themselves caught in gambling’s grip. Las Vegas possesses unique qualities for a city--its casino culture is embedded into neighborhoods far beyond the tourist-centered Las Vegas Strip and into the rest of the Las Vegas Valley. In addition to the more than two dozen huge casino resorts on the Strip, there are more than twenty-five full-service casinos specifically designed to lure the “locals” trade as opposed to tourists, as well as the dozen casino/hotels in the city’s older downtown district, which also in part cater to locally based gamblers. This gambling mecca has become the nation’s problem gambling capital. In the last several decades, gambling has been absorbed into every facet of life in Las Vegas, and the consequences have been dire. Local residents have found themselves hooked. In turn, this has helped lead to higher gambling-related social costs than anywhere else in the country. The Las Vegas area’s population has exploded over the last decade and residents are inundated with opportunities to gamble. There are 14,000 video poker and slot machines that chime day and night in Clark County, which includes Las Vegas and its suburbs, in more than 1,400 restaurants and bars and retailers of all types, from big-chain groceries and drug stores to 7-Elevens and Kmarts. That is not counting the 1,150 machines at McCarran International Airport. They are seemingly everywhere. Upon arrival, new residents find the highest problem and pathological gambling rates in the country and more Gamblers Anonymous chapter meetings than in any other city--fourteen per day on average. There are an estimated 115,000 adult problem and pathological gamblers in Nevada--mostly clustered in and around Las Vegas. Their issues have become fixed parts of the region’s communal landscape. Partially due to this, Las Vegas and Nevada boast higher rates of crime, bankruptcy filings, home foreclosures, divorces, and suicides than anywhere else in the country. It would not be fair or correct to conclude that the highest problem gambling rates in the country were the direct and sole cause of these problems. For example, authorities have noted that local police have been unable to grow as fast as the population, a contributing factor to the high rate of crime. There are other similar, valid, if partial, explanations for each of these indicators--including the notion, bolstered by studies on the region, that Las Vegas often attracts people inclined to contribute to these social ills. Yet in survey after survey, it has become clear that increased problem gambling leads to increased social costs. In dollar terms, a study on the topic coauthored by prominent University of Nevada, Las Vegas (UNLV), researchers concluded that problem and pathological gambling among southern Nevada residents results in costs conservatively estimated to be between $301 million and $469 million per year. There can be little question that Las Vegas is a damaged community--and no doubt at all that the effects of gambling’s immersion into its culture has played a significant role.